I wonder if that is enough bees to pollinate my garden? That's awesome. I'm not too concerned about my local population with the mild winter along with early and abundant sightings of bees this spring. My son tells me that the hive in a nearby tree is extremely active. He watched them attack a bird that landed near the hive. I hear that the US Postal Service is having issues dealing with the bee shipments this year. 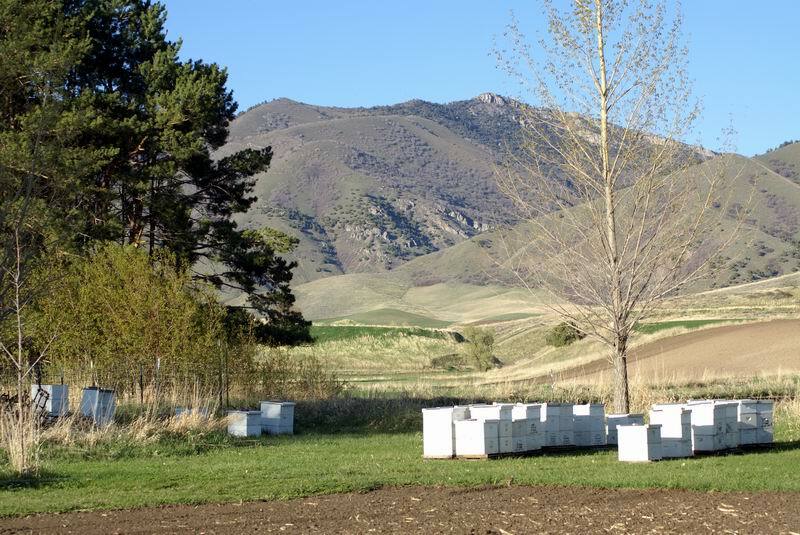 There is alot more interest in beekeeping now than there has ever been in recent history. That's good news. I don't know....looks like maybe too many. I would be willing to give a good home to a couple od hives for you. Are they starting to stir yet? In my garden, bumble bees are very active, and small probably native bees, but not many honeybees yet. I'll see a lot more of them once the clovers start blooming. i hate bees.. and i garden.. go figure! Yes, 28 colonies, and yes, they are very active when the temp is above 50Ã‚Â°. Most days now get that warm. We even got into the upper 60s the other day. Dandelions and fruit trees are blooming. The bees are loving these blossoms. Our big honey flow comes from alfalfa, but that is in June and July. Hay.....thats not fair. I want some too. I found a few wasp nests in my neighbors bushes. I have seen wasps flying in and around my garden lately. And I'm not gonna tell the neighbor about them either. Back in March, the bumble bees were all over our Wisteria. I had cut it back over the "winter" and there were purple blossoms everywhere. When you walked by it the bush literally hummed. Can't wait to see what they do this summer. Hopefully, the cold snap, as brief as it was, didn't do them in. You are a much braver soul than I am. I just took down one of the hummingbird feeders here, because the yellow-jackets took it over, yikes. Ha, I hung a wind chime in it's place. I still have hummingbirds visiting & I have one bumble bee, who sounds like a B2 bomber who visits. Do bumble bees like particular flowers or something? I never see them. I've got 2 different hummingbirds regularly visiting my garden. One of them actually tries to chase the other one off. I am seeing a lot more bee activity since adding a lemon tree and lime tree, plus other flowers. I get every bee type in my yard. Bee, some blacks ones that are bigger then bees but all black and shine, and bumble bee's the buzz is so loud you can hear it across the yard. PunkRotten wrote: Do bumble bees like particular flowers or something? I never see them. I've got 2 different hummingbirds regularly visiting my garden. One of them actually tries to chase the other one off. I am seeing a lot more bee activity since adding a lemon tree and lime tree, plus other flowers. I purposely plant a variation of flowers in the garden to help with polinizaton. Different pollinators are lured by certain colored flowers. Mostly red, yellow, & orange, & purple will do the trick!! Hummingbirds prefer tubular flowers that will accomodate their beak, such as tullips; while others prefer the flat-er flowers, such as bees etc.